It’s been a while since we have had a Foodie Friday blog post. Well we decided to feature a local business that we found. They have amazing cupcakes. Buttercream Cupcake Cafe is located in Chesapeake, Virginia owned and operated by Kimberly Dionne Middleton. Whether you are calling to place an order or walking through the door of the cafe, you are always greeted with a smile. Spending over an hour in the cupcake cafe we tried out four different flavors (we will share two with you today) which is only a tiny percentage of their evolving menu. 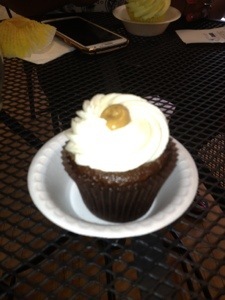 This is the Elvis cupcake. Yes, we said Elvis, a moist chocolate cupcake with a peanut butter filling, topped with a banana buttercream and a dollop of peanut butter. This was a great combination of flavors that marry well and creates a dance party in your mouth. This explains what was left of the cupcake. 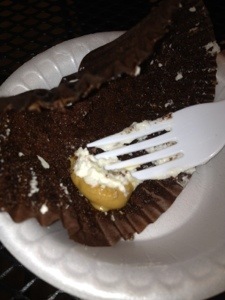 We meant to take a picture of the inside of the cupcake but it was so good we couldn’t put the fork down. Can you say Apple Pie? Imagine gramma’s apple pie inside a rich cupcake with an apple filling. This is what you get. Kimberly mentioned adding a scoop of vanilla bean ice cream, but we couldn’t wait to get the cupcake home to try it, so we just ate it plain. 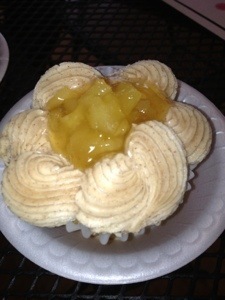 Buttercream Cupcake Cafe has a wide variety of flavors with a menu that changes with the seasons. Summer is coming so look out for Tropical Paradise and Watermelon. Visit Buttercream Cupcake Cafe for a delicious cupcake or better yet, place a catering order. You will not be disappointed. I’m back with an announcement! !